Addendum 1: For those who still think there was something terribly unusual about the response to the Sandy Hook School shooting, I’ve summarized the findings of the After Incident Report on the 2012 Aurora Theater shooting, and the After Action Report on the 2013 Boston Marathon Bombing, both of which suffered from some of the exact same problems. 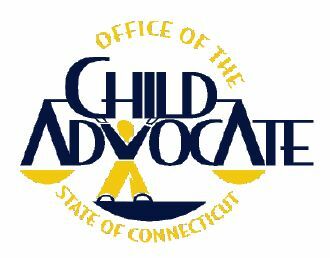 Addendum 2: Lists the key findings of the CT Office of Child Advocate investigation, released in November 2014, into the personal, educational, mental health and medical history of Adam Lanza, the possible contributions to the tragedy, and recommendations for better community engagement. Addendum 3: Details Adam Lanza’s gun purchasing history & on-line personas, which appear to have been his proxy method of acquiring and then sharing knowledge about the best guns to use for mass murders. Nota Bene: I will gladly publish constructive comments or reasonable questions (which I will do my best to answer), but I will not publish moronic or vulgar comments from the “truther” community which contribute nothing but a venomous hatred for truth and an utter disregard for the pain of the victims’ families and of the survivors (who include all the first responders to this tragedy). I’m amazed and saddened that, more than three years after this terrible tragedy, this article remains one of the most visited of the more than 100 I’ve published here, with search terms such as “sandy hook hoax” and “was sandy hook real”. But it also makes me feel that the enormous amount of time I put into researching, writing and updating this article may be worthwhile if it allows readers to understand the horrible truth about the event and the terrible untruths at the core of the “Truther” movement. WARNING: Since I’m still getting the occasional moronic comment from “truther” acolytes, in spite of my polite notice above, I will henceforth publish their email addresses and encourage readers to send frank opinions about those who continue to propagate the hateful nonsense that there was no killing at Sandy Hook in 2012.
gabrieljean_37@yahoo.com used the common scam of attempting to post a lengthy comment, beginning with a complimentary sentence, followed by paragraphs of the typical misinformation and misdirection that is the stock-in-trade of the conspiracy nuts who prefer ungrounded fantasies to the self-evident and thoroughly-documented truth. Jack Low (low20012001@gmail.com) was the first New Year conspiracy nutcase who, while trying his best to sound reasonable (see his comment below), has swallowed a number of thoroughly debunked false claims and then has the audacity to claim a skeptical “open mind”. Arabella (lawandcrim1995@icloud.com) pretends to be a UK student of criminology, but then asks questions which any cursory study of this tragedy would have easily answered, with at least two of her questions based on demonstrable falsehoods or willful ignorance. This has become the modus operandi for Hoaxers: disguising their malicious propagation of lies by asking “innocent” questions. dalesmith833@yahoo.com pretends to have his intelligence insulted when others refuse to believe that the event was a “hoax” that was used to force through gun control and mental health screening of children. In fact, he merely proves that he has no critical intelligence, and has chosen to join the “useful idiots” who despise truth and justice. Chet (chazzp68@gmail.com) takes the prize for willful idiocy and “I know you are but what am I” sandbox projection of his/her/it’s infantile, anti-fact, anti-reason, anti-science blindness, claiming that, by publishing this thoroughly documented and objective overview of the facts, I have “replaced science, reason and ethics with a childish contrarianism” and my “cowardly” treason “will be known for all time”. It’s hard to imagine that anyone could be that stupid, but then again, there are enough of these imbeciles to put a treasonous and corrupt moron in the White House. “Rhyno” (rhyno53@yahoo.com – probably a fake email address, as with most such cowards), who claims (see comment below and my reply) that governments always lie and this government (whatever that means, since the administration has changed dramatically since this incident) is the greatest liar. On the morning of December 14, 2012, one of the most horrific and deadly school massacres occurred in the quiet suburban community of Sandy Hook Connecticut. It was the second deadliest mass shooting by a single person in American history, after the 2007 Virginia Tech massacre, and the second deadliest mass murder at a US elementary school, after the 1927 Bath School bombings in Michigan. What made this event unique, however, was that most of the victims were first graders who were killed by multiple (from 3 to 11) gunshots. 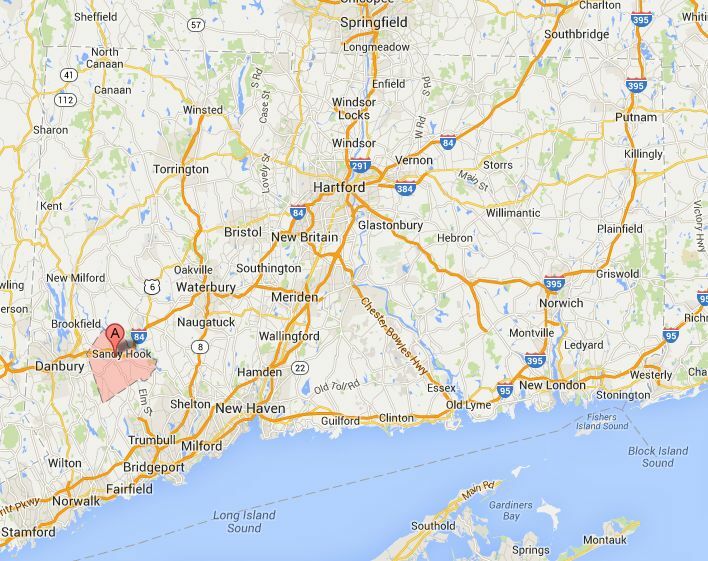 Newtown is located in Fairfield County, Connecticut, about 60 miles outside New York City. Violent crime had been rare in the town of 28,000 residents; there was only one homicide in the town in the ten years prior to the school shooting. This, however, is not unusual for school rampage shootings, as very often the first response is “we never expected this to happen here”. The shooter, 20-year-old Adam Lanza, diagnosed with “profound Autism Spectrum Disorder” & symptoms of Obsessive Compulsive Disorder six years earlier, and a former student of Sandy Hook Elementary School, had shot his mother four times in the head as she lay asleep in her bed. He then drove his Honda Civic to the school, parked in a “no parking” zone and shot his way through the plate glass next to the newly-hardened glass doors which can be opened only by buzzers in the office, once visitors are screened via non-recording closed-circuit TV. When the school principle, Dawn Hochsprung, and school psychologist Mary Sherlach left a meeting to investigate, they were shot dead, and lead teacher Natalie Hammond was wounded. Lanza then entered two first grade classrooms and killed 20 five- and six-year-old children (two of whom died en route to the hospital), and four more teachers. Lanza entered a first-grade classroom where Lauren Rousseau, a substitute teacher, had herded her first grade students to the back of the room and was trying to hide them in a bathroom. Rousseau, behavioral therapist Rachel D’Avino, who had been employed for a week at the school to work with a special needs student, and fifteen students in Rousseau’s class were killed. Fourteen of the children were dead at the scene; one was transported but declared dead at the hospital. The family pastor of a six-year-old girl who survived said that she did so by playing dead. Most of the children’s bodies were in a pile in a tiny bathroom where they had gone to hide. Lanza then entered another first-grade classroom where teacher Victoria Leigh Soto had concealed some of the students in a bathroom and some of the other students were hiding under desks. Soto was walking back to the classroom door to lock it when Lanza entered and killed her. As Lanza reloaded the gun, nine children ran past him and were able to leave the school (six of them and a school bus driver took refuge at the nearby home of 69-year-old retired psychologist Gene Rosen). Anne Marie Murphy, a teacher’s aide who worked with special-needs students in Soto’s classroom, shielded six-year-old Dylan Hockley with her body, trying to protect him from the bullets that killed them both. Thirty-five EMTs responded to Sandy Hook Elementary School from the Newtown Volunteer Ambulance Corps, the largest volunteer ambulance squad in the state, with more than 2,200 calls and more than 30,000 person-hours logged every year. Thirty-nine officers and members of the Sandy Hook Volunteer Fire & Rescue Company responded, in addition to seven support personnel and one junior firefighter. 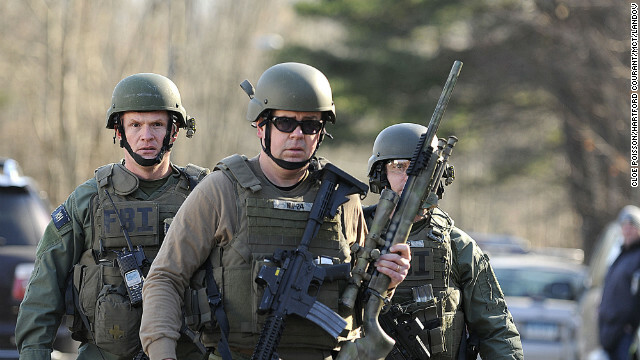 Within minutes of the first 911 emergency call, officers from the Newtown Police Department and Connecticut State Police arrived on scene, later followed by personnel from the FBI, ATF, and US Marshals Service. Connecticut Governor Malloy and Lt. Governor Wyman showed up within hours. Police scouted the perimeter, then entered and swept the school from two directions, and set up a triage area outside the school doors. Others set up an area at a nearby fire station where parents could be reunited with their children, and cordoned off a designated area for the news media. 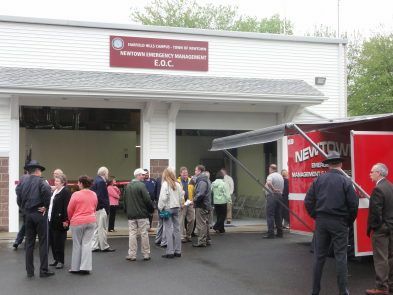 Jeffrey Silver, a Newtown police officer since 1999, headed up operations at the Newtown Emergency Operations Center (EOC), three miles from the school, which transformed quickly from an emergency response center into an investigative operations center. Investigators from a number of agencies set up shop at the center, combing social media websites for clues. A judge was on hand to sign off on search warrants. While this active-shooter mass-casualty event succumbed to the “fog of war”, generalized confusion and chaos that is typical of almost all such fast-moving and emotionally-charged events, the police, EMS and fire personnel responded quickly, acted appropriately, and in spite of courageous efforts, were simply too late to prevent the mayhem or save the victims, except for the two adults with gunshot wounds who survived. The primary problem created by the rush of first responders, terrified parents and the media, was the traffic congestion on Dickerson Drive, the only access road to the school. 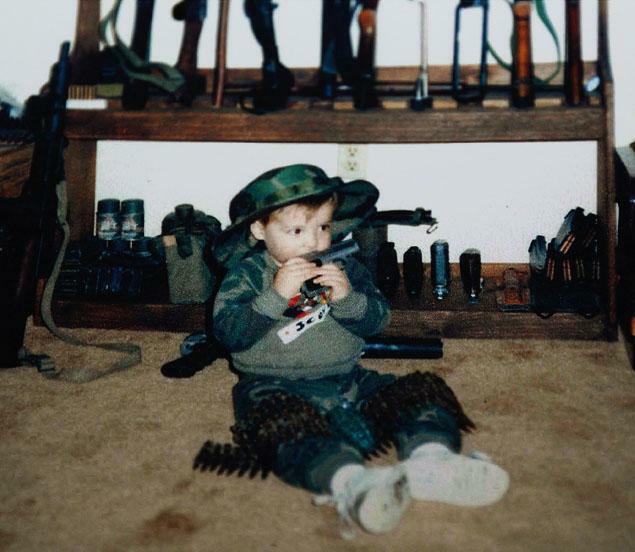 But, in spite of the difficulties that presented, it did not affect the outcome – which, as is too often the case, was already written by the fates and determined by the firepower that Adam Lanza brought with him to this well-planned act of what expert Jonathan Fast, PhD, calls “ceremonial violence“. Dressed in black, the six-foot-tall 112-pound Adam Lanza carried 30½ pounds of weaponry, including the Bushmaster XM15-E2S with ten magazines and 301 rounds of ammunition, a SigSauer P226 9 mm handgun with six magazines and 116 rounds, and a Glock 20SF 10 mm handgun with six magazines and 90 rounds. In just six short minutes, Lanza expended 154 rifle rounds and had another 147 remaining when he took his own life one minute after the first police officer arrived outside the school. Yet, almost immediately following the event, conspiracy theories began to spread in cyberspace almost as quickly, and with almost as harmful effect, as the .223 caliber (5.56mm) bullets flying from Adam Lanza’s Bushmaster AR15-type assault rifle (gun apologists will insist that an “assault rifle” is only the fully-automatic carbine used by the military, but it is an appropriate term for the civilian knock-off that has been marketed aggressively through commando imagery and military descriptions by the US gun industry, which was the first to use that term in the civilian market). At best, these “truthers” are certain that there was something terribly wrong with the response to the shooting incident – something that required a massive cover-up, including the passage of new laws limiting public access to juvenile crime scene depictions. The most pernicious of these, however, insist that the event was staged by “crisis actors” and that no one really died, with the goal being the infliction of more gun-control laws by the Obama administration. Americans have an unusual fascination with conspiracy theories, in part because our nation was founded on a Grand Conspiracy Theory, articulated in the Declaration of Independence and accepted by all the Founding Fathers, and because – at least since the JFK assassination, which the overwhelming majority of Americans never believed to be the result of a crazed lone gunman – there has been a great deal of research into the many very real government-inspired conspiracies and cover-ups, from the “surprise attack” on Pearl Harbor to the neocons’ “New Pearl Harbor” of 9/11. However, while every war since the Spanish-American war was “sold” to the American people by false-flag “terrorist” or enemy attacks or other lies, and while JFK, MLK and RFK were all killed by their own government intelligence agencies and covert partners, some events that are so obviously just plain tragedies are assumed to be conspiracies by those with too much time and too little experience and common sense. The Sandy Hook massacre was one of those. So, after extensive personal investigation and study of this event (as well as many other school rampage shootings), I offer a summary and overview of The Real Story. As to my own credentials, I have been a volunteer firefighter, off and on, for 30 years, a volunteer EMT for 20 years, a Wilderness EMS Instructor and an ambulance training officer, a technical rope rescue instructor for 14 years (including mountain rescue, ice rescue, fast-water rescue, cave rescue, and industrial rescue), a Wilderness Search & Rescue Technician and instructor for 10 years, a municipal Emergency Management Coordinator during Y2K in a small town next to a nuclear power plant and below a hydroelectric dam, and a Critical Incident Stress counselor. I have training and experience in mass-casualty events and triage, and helped train doctors, nurses and paramedics as well as a FEMA urban search & rescue team. My rope rescue training web site is aVERT: a Vertical Emergency Response Training. In an active-shooter scenario, the first responsibility of police officers is to secure the scene, locate and neutralize the shooter(s), evacuate survivors if possible to do so safely while preserving the crime scene as best as possible, and then methodically search both indoor and outdoor spaces so that the site can be “cleared” of threats. Since the 1999 Columbine High School rampage shooting event, in which police officers waited for a SWAT team before making entry to the building, it’s become standard practice for the first responding law officers to attempt to enter and neutralize an active threat, though some departments require a minimum 3-person “active shooter formation” which protects the flanks and rear and leaves no responder alone without assistance. It is standard operating procedure for EMS units and personnel to stage outside the “hot zone” until the area is cleared for safety by law enforcement officers. When rapid patient assessment and extrication is necessary, only tactically-trained medics with ballistic vests are allowed to enter a hot zone before clearing. Unlike with ordinary untimely deaths that require a physician or medical examiner to declare death, in a mass-casualty event, whether natural disaster or man-made, the START (Simple Triage And Rapid Treatment) system is implemented which allows trained EMS personnel to quickly ascertain whether victims are dead (no pulse or respiration after opening the airway), “walking wounded” (green tag), have injuries that can accommodate delayed treatment (yellow tag), or in need of immediate life-saving intervention such as airway or bleeding control (red tag). Among the law enforcement first responders, there were two EMTs (CSP Sgt William Cario and TFC Patrick Dragon), and one Registered Nurse (CSP Sgt. William Blumenthal). Six and a half minutes after his arrival at the school, and after the shooter’s body and those of his victims were found, Sgt. Cario switched to a medic role, put on gloves and performed the first patient assessments. Approximately 11 minutes later, Sgt. Cario escorted three tactical and highly-trained paramedics into the school to perform four additional rounds of patient assessment and triage, including the use of heart monitors. 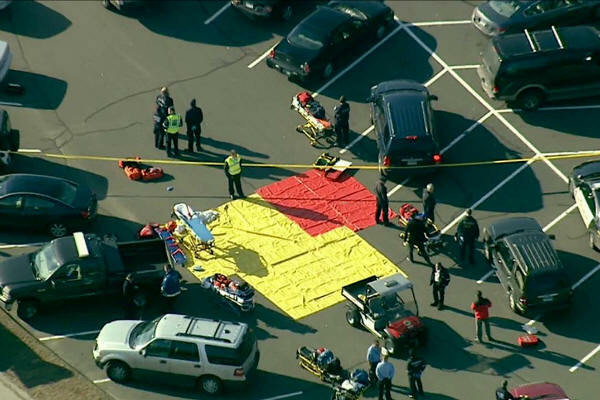 Paramedic and Director of Danbury Hospital EMS Matthew Cassavechia, tactical Paramedic and Danbury EMS supervisor John Reed, and Paramedic and Assistant Fire Chief Bernie Meehan were the three triage officers. The legal presumptions of death were made by this team, using the SMART Triage System protocols. Cassavechia operated as the senior medical person on scene and maintained phone contact with Danbury Hospital Medical Control Physician Dr. Pat Broderick, under whose medical authority the paramedics operated. The final determination of cause and manner of death was made the next day by the Connecticut Chief Medical Examiner, who set up a temporary morgue in an army field tent at the school. As deceased victims were removed from the school building, the Chief Medical Examiner sought to make positive identification of the victims through photos, school records and personal and clothing descriptions, so that waiting parents could be properly notified. On Saturday, December 15, 2012, all of the victims were transported to the Office of Chief Medical Examiner (OCME) in Farmington for autopsies, which were performed that same day. The cause of death for all of the victims was determined to have been gunshot wounds from the .223 caliber AR-type rifle; the manner of death was determined to have been homicide. Evidence collected during the autopsies was turned over to CT Division of Major Crimes (CDMC) and forwarded to the Division of Scientific Services for examination. Carefully documented chain of custody records were kept of all crime scene evidence removed from the school. 9:30:00 Front door is locked. Entry requires being buzzed in by the main office personnel. 9:30:00 Parent arrives for the gingerbread house event and has to be buzzed in. 9:34:00 The first gunshots are heard by gingerbread house parent (approx. 15 shots). 9:35:00 A parent arrives at school and notices nine children (from room #10) running down the sidewalk. 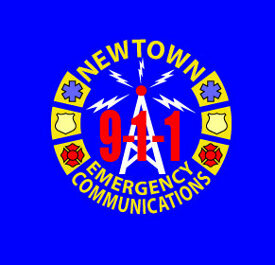 9:35:39 First 911 call to Newtown PD is received from school nurse’s office after shooter leaves office. 9:35:43 First 911 call to the CSP Centralized Dispatch comes in. 9:35:56 Newtown Police in station depart for scene. 9:36:06 Newtown Police Department dispatcher broadcasts that there is a shooting at SHES. 9:36:17 School Janitor Rick Thorne connects to 911 NPD. 9:36:49 911 call from school reports that SHES is in lockdown. 9:37:38 Connecticut State Police are dispatched to SHES for active shooter. 9:37:39 Sgt. Kullgren, Officer Chapman and Officer McGowan enroute to SHES in three-car convoy. 9:37:40 Sgt. Kullgren orders officers to drive up Crestwood – other cars are staging in driveway. 9:38:00 Teacher Deborah Pisani calls 911 CSP to report shooting and that she’s shot in the foot. 9:38:43 Parent in conference room #9 calls 911 CSP to report she’s with 5 other adults, one of them shot twice. 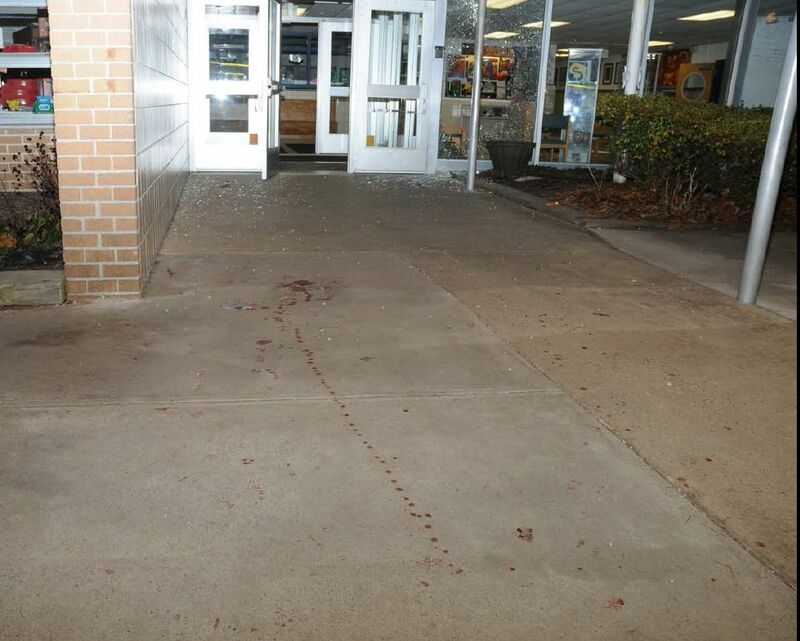 9:38:44 Same parent reports that shooter might be outside the door and that 100 shots were fired. 9:39:13 Sgt Kullgren and Officer Chapman arrive at SHES and park on the driveway near the ball field. All arriving NPD officers report hearing gunfire. 9:39:26 Sound of six gunshots on open line to Rick Thorne. 9:39:34 Officer McGowan encounters unknown male running along the east side of SHES with something in his hand, starting rumors of more than one shooter. 9:40:03 Last gunshot is heard on 911 CSP call (believed to be the final suicide shot in classroom 10). 9:40:05 Officer Penna arrives, parks his cruiser on Dickinson Drive and runs to front of SHES. 9:40:15 Sgt Bahamonde arrives in the driveway of SHES. 9:40:46 Officer McGowan has man (father of 1st grader) in custody on east side near playground. 9:40:51 CSP Sgt Cario, McGeever, Kick, Katrenya, Cipriano, Benecchi, Blumenthal, Gregg, Poach & Zullo responding. 9:41:07 Information is relayed that location of last known gunshots is in the front of the building. 9:41:54 CSP dispatch requests all available units to SHES. 9:42:27 Officer Seabrook enters Dickinson Drive. 9:42:39 Officer Penna calls out the license plate of the shooter’s car as he runs past. 9:42:47 Sgt Kullgren handcuffs parent Christopher Manfredonia in playground. 9:43:16 CSP Sgt Roden, Cournoyer, Dragon, Sgt Deltorto en route. 9:43:33 Officers Chapman and Smith complete a check of the perimeter (west and south side). 9:44:47 Rick Thorne in the west hallway is still on the phone with Newtown 911 – hears entering officers. 9:44:47 Lt. Vanghele, Sgt. Bahamonde, and Officer Penna enter through boiler room. 9:44:50 Sgt Kullgren, Officers Seabrook and McGowan enter a south east door and move to west hallway. 9:45:00 Bodies of two victims found in front hallway – officer radios for assistance. 9:45:10 Lt Vanghele, Sgt Bahamonde, and Officer Penna, verbally engage with Rick Thorne in hall. 9:45:17 Officers Chapman and Smith complete perimeter search and stand by front door. 9:45:20 Lt. Vanghele tells a female student to get back into classroom 8. 9:46:23 CSP Lt. Hofbauer, Lt Davis and Sgt Cario arrive at SHES. 9:46:48 CSP Sgt. Cario and Lt. Davis enter through broken window. 9:46:52 CSP Lt. Hofbauer enters through window. 9:47:00 CSP set up perimeter around school and soon begin evacuating children. 9:49:16 Sgt Bahamonde, CSP Kick & CSP Sgt. Cario run to playscape area on report of possible suspect. 9:49:58 CSP Sgt. Cario, Officer Smith, Officer Chapman, and CSP Lt Davis enter conference room #9. 9:50:28 CSP Det Dragon arrives on scene, runs to the front entrance with medical kit. 9:50:29 Newtown Police Detectives McAnaspie and Joudy arrive on scene. 9:51:31 CSP Lt. Davis, CSP Sgt. Cario, Officers Chapman and Smith enter room #10: “We’ve got one suspect down.” – Officer Smith finds two students hiding in the bathroom of room #10. 9:51:31 Officer Penna enters room #8 and finds one student, tells her to stay while he clears the hallway. 9:53:00 CSP Sergeant Cario begins EMS treatment & triage. 9:56:16 Officer Chapman carries injured student from room #10 across parking lot toward FH. 9:57:08 CSP Lt. Davis requests EMS to stage at the scene – injured being evacuated. Officer Penna hands off uninjured girl from room #8 to CSP McGeever in the front lobby. 9:57:40 CSP McGeever runs with girl across the parking lot toward the Sandy Hook firehouse. 9:58:35 Officer Smith carries two students to the parking lot, puts them down and runs with them to firehouse. 9:59:48 CSP Kick drives gunshot victim from room #9 in his cruiser to the fire station. 10:00:45 Teachers and student run across parking lot with CSP Keane to the firehouse. 10:02:10 Lt Vanghele and CSP Sgt. Cario drive “John Doe” to Fire House – ambulance staging. 10:03:29 Children evacuated to firehouse. 10:05:47 More children evacuated to firehouse. 10:05:50 Officers Smith and Seabrook check the roof of SHES. 10:06:08 Children evacuated from NE corner of school. 10:06:46 Adults from conference room #9 escorted to firehouse. 10:07:13 More children evacuated from NE corner of school. 10:08:19 More children evacuated from NE corner of school. 10:08:37 CSP Keane requests that the entrance to the parking lot of the school be closed off by the SHFD. 10:08:52 Sandy Hook Fire Department arrives and stages in the northeast portion of the SHES parking lot. 10:09:11 [Newtown] Sergeant Kullgren will be commanding officer. 10:09:15 401 [Chief Bill Halstead] will have command for fire. 10:09:29 More children evacuated to firehouse. 10:10:31 More children evacuated from NE corner of school. 10:11:00 I got multiple ambulance personnel coming in, can we create that staging area within the School parking area? 10:12:00 Negative Newtown, any ambulances coming in will have to stage at Sandy Hook firehouse and we’ll call em up. 10:14:44 More children evacuated from NE corner of school. 10:15:20 CSP O’Donneell calls to report clearing of rooms #23 and #24. 10:15:48 More children evacuated from NE corner of school. 10:16:51 More children evacuated from NE corner of school. 10:17:26 CSP O’Donnell calls to report searching back of building. 10:17:26 More children evacuated from NE corner of school. 10:18:05 More children evacuated from NE corner of school. 10:19:35 Members of Statewide Narcotics Task Force Northwest Office arrive on scene. 10:24:58 Newtown Lt Vanghele escorting Kaitlin Roig’s class (room #12) from the northeast corner of SHES. 10:26:55 New Haven FBI en route to the scene. 10:29:05 Fire Department establishes a perimeter of cones to keep bystanders back. 10:29:17 CSP Sgt O’Donnell calls CSP to inform that first search complete and second search beginning. 10:30:13 CSP Emergency Services Unit (ESU) arrives at the SHES. 10:31:33 CSP Sgt O’Donnell calls dispatch to inform that he’s removed 18 students and teachers from library closet. Dispatcher advises O’Donnell that there’s still students and a teacher in the kitchen closet. 10:32:59 More children evacuated from NE corner of school. 10:33:03 More children evacuated from NE corner of school. 10:33:24 More children evacuated from NE corner of school. 10:50:00 Newtown Police Chief Kehoe announces command post at firehouse. 10:50:17 Officer McGowan forms a team to respond to Lanza residence. 10:52:03 A3, at this time you can go back to the station and standby. 10:52:15 Sgt. Kullgren requests a floor plan of SHES for a complete search. 10:58:19 Sgt. Kullgren requests Monroe K9 team and Officer Figol’s K9 to report for additional searches. 11:01:58 Officer McGowan and team are at Yogananda Street evacuating neighboring homes. 11:03:32 Officer Greco reports he has a description of the shooter from children at PD. 11:16:47 Officer McGowan announces perimeter is set up at Lanza home and surrounding homes evacuated. 11:25:27 Chief Kehoe has School Superintendant act as liason to parents at CP. 11:30:23 CSP SWAT, K9s and others are doing fourth full sweep of school. 11:31:42 State Attorney arrives at PD. 11:40:39 Second Command Post is set up at Fairfield Hills EOC. 11:43:48 Emergency Service Unit (ESU) is en route to Yogananda Street. 11:45:36 Public Information Officer (PIO) is set up at Treadwell Park to the east of SHES. 9:38:00 Deborah Pisani calls 911 (CSP dispatch) to report shooting and that she’s shot in the foot, with 2 adults. 9:51:31 Officer Penna enters room #8 and finds a child, tells the student to stay in the room while he goes to room #10 to make sure the hallway is secure. 9:53:00 CSP Sergeant Cario begins EMS treatment & triage – rooms #9, #8, #10. 9:56:16 Officer Chapman carries injured student (“Jane Doe”) from room #10 across parking lot. 9:57:08 CSP Lt. Davis requests EMS to stage at the scene – injured being evacuated. 9:57:40 Officer Penna hands off (uninjured from room #8) girl to CSP McGeever in the front lobby, who runs with girl across the parking lot toward the Sandy Hook firehouse. 9:58:35 Officer Smith carries two students (from room #10) to the parking lot, puts them down and runs with them to firehouse. 9:59:48 CSP Kick drives (Hammond) from room #9 in his cruiser to the fire station staging & triage area. 10:02:10 Lt Vanghele and CSP Sgt. Cario drive student “John Doe” to Fire House – ambulance staging. 10:08:37 CSP Keane requests that the entrance to the parking lot of the school be closed off by the FD – “we don’t need any more people in here we’re just trying to set up a safe perimeter and remove all the students”. 10:08:52 Sandy Hook Fire Department arrives and stages in the northeast parking lot for EMS triage. 11:36:00 Dr. Robert Solstice, attending ER physician at Danbury Hospital confirmed that the two children were DOA. From the time the unknown male was encountered by the Newtown police outside of SHES until after the staff and children were evacuated, all responding law enforcement operated under the belief that there may have been more than one shooter and acted accordingly. For example, K-9 units were brought in to search the area and officers were posted to act as lookouts to ensure the safety of those evacuating the school building. Some civilians were located in the areas surrounding the school as the searches and evacuations were taking place. Some of those individuals were treated initially as suspects and handled accordingly, including being handcuffed, until their identities and reason for being there could be determined. 3. a man from New York who was working in a nearby town and went to SHES after an application on his cell phone alerted him to the situation at the school. He drove to the firehouse and went up to the school on foot. He was taken from the scene of the school in handcuffs and later to Newtown Police Department, where it was determined that he did not have a connection to the shooting and had gone to SHES to see what was going on. Stopping the active shooter was the first priority. Once that occurred, the location and treatment of the victims, the search for additional shooters, and the safe evacuation of the school were of primary importance. The collection of evidence and the preservation and documentation of the crime scene, while important, were secondary to safety and the assessment, treatment and evacuation of the injured. It was one minute and 39 seconds from the first gunshots to the first 911 call from the school nurse who came out from hiding once Lanza left her office. It was 27 seconds from the first 911 call to Newtown dispatching its police department, and only 19 seconds from dispatch to the first NPD officer responding. 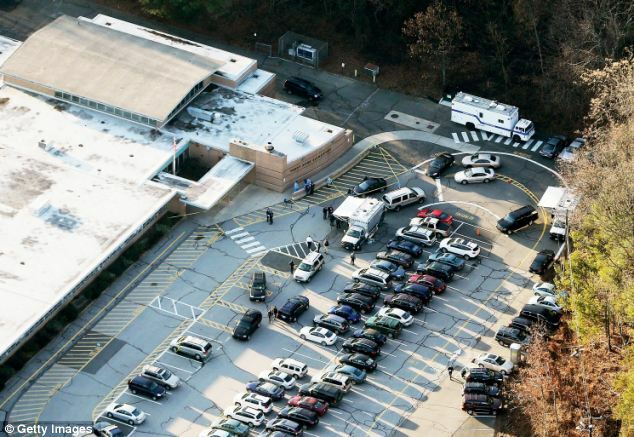 It was a minute and 32 seconds from the Newtown dispatch to the State Police dispatching of its forces for an active shooter event at the school. It took 2 minutes and 54 seconds from the time of dispatch for the first Newtown police officer to arrive and stage on the road just behind the school. 13 seconds later, two more Newtown officers stage on the school entry road next to the ball field. Arriving police officers report hearing gunfire. Thirty-four seconds after Officer McGowan arrived, he encounters and arrests a man running along the east side of the school with something in his hand. It turns out to be a worried parent with a cell phone, who is handcuffed and then released. One minute and 3 seconds after the arrival of the first police officer, the last shot is heard, later thought to be Adam Lanza’s suicide shot to his head. Within four and a half minutes of arrival, Officers Chapman and Smith complete a perimeter check of the school. When the first report of a gunshot injury is called in, two Newtown ambulances are dispatched within seconds. Less than six minutes from arrival, two 3-man active-shooter formation teams enter the school from different sides. At six minutes, the first two bodies are found in the front hallway. At seven minutes and 13 seconds after first arrival, the first Newtown ambulance arrives and stages in a safe zone. Seven minutes and 23 seconds after first Newtown police arrival, the first three state troopers arrive, and 15 seconds later two of them enter through the broken front window, with the third right behind them. Eight minutes after first police arrival, the troopers set up a perimeter and begin evacuating children from the school. At five minutes 11 seconds after first entry, a four-officer team enters conference room #9 and finds Natalie Hammond bleeding on the floor from gunshot wounds to her hand and leg. At six minutes 44 seconds from first entry, the same team enters classroom #10 and finds “one suspect down”, but no one is sure there aren’t more shooters. At eight minutes 13 seconds, CSP Sergeant Cario switches to an EMS role and begins applying quick “combat dressings” to the wounds of Natalie Hammond, and then does triage on the other victims. At eleven minutes 29 seconds from first entry, Officer Chapman carries an injured girl from classroom #10 toward the fire house ambulance staging area. All medical personnel are staged in the safe zone since the school is not yet cleared of possible threats. At fifteen minutes from first entry, Trooper Kick drives the injured Natalie Hammond to the EMS staging area in his cruiser. At 17 minutes 23 seconds, Sgt. Cario and Lt. Vanghele drive the gravely injured student “John Doe” to the EMS area and place him in an ambulance. Almost a half hour after the first gunshots are heard, 28 minutes after the first 911 call, 27½ minutes after the police were dispatched and 19 minutes after first entry was made, three tactical paramedics are escorted into the front of the school by CSP Sgt. Cario to do an official triage and assessment of each gunshot victim, all of whom have already been triaged and determined to be dead by Sgt. Cario, who has 32 years of EMS experience. Thirty-three minutes after the first 911 call, CSP Trooper Keane requests the Newtown Fire Department close off the school entry road as parents are starting to flood in and get in the way of a still-active threat event. Children and teachers are continuing to be evacuated, one classroom at a time, to the fire house. Thirty-three and a half minutes after the first 911 call, an integrated command system begins to be established, with Newtown Sergeant Kullgren assuming police command, Fire Chief Bill Halstead assuming fire command, and EMS command and triage area set up in the school parking lot at about 48 minutes, under the mistaken belief that there will be more patients. At 45 minutes from 911, it was still believed that there might be a second shooter, and it was a full hour after the first 911 call that the scene was declared “cleared” by the police teams, after the perimeter, the roof and every room had been inspected at least once. At the two hour mark, SWAT and K-9 teams were doing a forth sweep of the entire school to make sure nothing was missed. 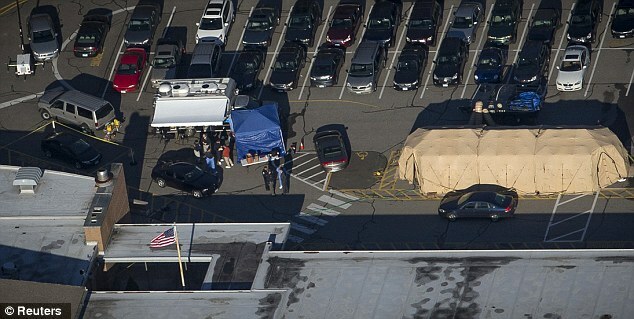 By that point the school superintendent, the state attorney, the Western District Major Crime (WDMC) Unit and an Emergency Services Unit (ESU) were setting up at the school or command post, the FBI was en route, and a secondary command post was established at the Newtown Emergency Operation Center to coordinate the investigation. Eleven hours after the first gun shots rang out, the victims’ and shooter’s bodies were removed from the crime scene and brought to the Office of the Chief Medical Examiner (OCME). 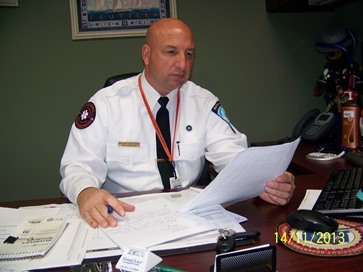 Once a command post was set up in the Sandy Hook Firehouse, Major Meraviglia (CO of CSP Western District) took command of the crime scene, Major McLean (CO of CSP Central District) oversaw all other operations including securing the Lanza residence, Major Hyatt (CO of the CT Bureau of Criminal Investigation) assumed command of victim/family services. Crime scene processing for such a complex event required a full week. A little before noon, after the shooter had been neutralized, the crime scene cleared of possible additional threats, the injured transported to hospitals, the rest of the victims determined to be dead, the remaining students and staff evacuated, and a fourth and final sweep of the school completed, a more formal Incident Command System was implemented to respond to grieving parents, the inquisitive media, the need to protect the crime scenes (both the school and the Lanza house), and to initiate the forensic and criminal investigations. This is exactly how the Incident Command System – developed in the 1970s by the US Forest Service to better coordinate large-scale, dynamic, multi-agency emergency events and efficiently and effectively allocate resources while keeping the communication and command scope manageable – was intended to function. Initial responders rely on their usual chain of command and protocols, often coordinated by well-trained dispatchers, until the event expands and complexifies to the point of requiring a more formal hierarchy of command, control and communication. Once formal command centers are established, with the highest-ranking officials from each department working together to coordinate the ongoing response (which may last many hours or days), functions are assigned according to need, including command, operations, planning, logistics, and finance and administration, as well as investigation and intelligence. 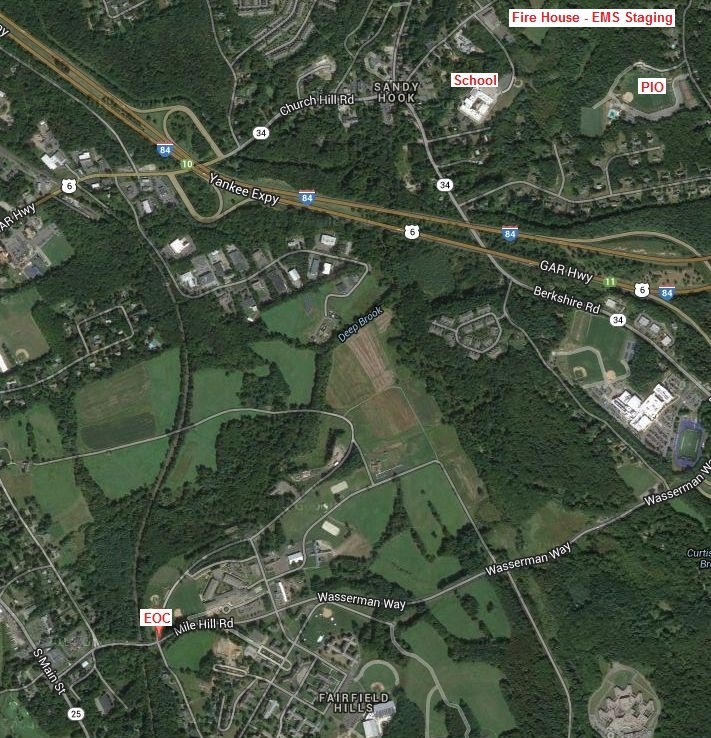 As is evident in the aerial map above, by noon a central incident command post was set up remotely from the crime scene at the Newtown Emergency Operation Center (EOC), which had communication and planning facilities. A Public Information Office (PIO) was set up in the nearby Treadwell Park to keep the media informed while also keeping them away from the active scene. The Newtown Firehouse continued to be used to reunite parents with their children and for civilian grief counseling, while a temporary morgue and other investigative units were located in the school parking lot. While no response is perfect, and every such event is followed by both intra-agency and inter-agency debriefings and incident reviews to determine lessons learned and areas for improvement, the Sandy Hook school rampage shooting response was unexceptional. The primary deficiency was the failure to immediately control traffic on Dickenson Drive, the only access and egress route to the school, but that was ordered by the state police 22 minutes after their arrival on scene and implemented by the Sandy Hook Fire Department. To get a sense of the tension and horror of the crime scene during its first moments, I’ve excerpted a good part of CSP Sergeant Cario’s interview report (all responders, all witnesses and all survivors were interviewed as part of the ongoing investigation). The next room that I remember entering was Room #10… I recall feeling that this was a high risk entry… I did not know the status of the shooter until I ran past his body… The shooter appeared to be of small stature and I did not know if he was a victim, but I then recognized a handgun near his head and another handgun secured on his person. My immediate impression was that he had committed suicide by shooting himself in the head… I do not recall the specifics of his injury, but I recall that his injury was not consistent with life and I did not check him for vitals or remove the weapons from him. The first victim I came to in Room #10 was an adult female… I observed another adult female near a child a distance away. There were also a number of child victims in the room. I remember moving quickly among the bodies, checking for signs of life and I triaged their injuries. Some had injuries which were obviously not consistent with life; others took a little more time. It was my assessment that all victims in Room #10 were dead or gravely injured. …my next memory is entering Room #8… I observed the bodies of two adult females lying on the floor… there was an open door in the southwest corner of the room. I initially thought this was a closet. As I approached the door, I was initially unable to comprehend what I was looking at. As I stared in disbelief, I recognized the face of a little boy on top of a pile… I then began to realize that there were other children around the little boy and that this was actually a pile of dead children… I recall that many had horrific injuries. …I decided that my services were best utilized if I worked in an EMS capacity as others worked to clear the building. (I have been active in EMS rescue associations and have held the certification of EMT or EMT Intermediate for more than 32 years). As I ran down the hall, I made a general statement that the injured should be brought to the front of the school for transport. I ran out the front of the school to TFC Kick and asked for his first aid kit as he had the only vehicle near the school. During this time I believe I first learned that there were two jackets outside the suspect’s vehicle and there were suspicions of a second shooter… I grabbed the kit and told TFC Kick to leave the keys in his car as well as to call for two additional cars to come up to the school to evacuate the injured, as we could not yet call ambulances in. TFC Kick called for additional patrol vehicles to the scene and I ran back into the school with his first aid kit (CSP radio time: 09:53). My assessment was that I needed to treat the injured woman in Room #9 first. That woman had serious injuries but had a good prognosis if I could control her bleeding. The others all appeared to be dead or gravely injured on my initial assessment. I entered Room #9, donned gloves, and proceeded to treat the injured woman as Msgt. Davis covered me from the door. Msgt. Davis asked the victim for a description of the shooter and the victim, although very emotional, reported that the shooter was wearing black and had a mask. That was not what we had observed in Room #10. Msgt. Davis then directed a local officer to cover me while he left with the information about a possible second shooter. At one point I borrowed a knife from the local officer and cut the pants from the left leg of the female victim. I quickly bandaged her left leg and left hand, apologizing for the combat medicine and telling her this was just to get her to the ambulance. Not knowing how many patients I would treat, I tried to conserve medical equipment. As I was bandaging the woman’s hand, CSP Detective Patrick Dragon entered and identified himself as an EMT..
Det. Dragon and I placed the woman in [a wheeled office] chair, one of the females in the room asked “Should we follow you out?” I said it was not safe, we needed to evacuate the victim, and that they would be safe where they were… I wheeled the woman out the front door and stopped near TFC Kick’s car. TFC Kick and I assisted the female victim into TFC Kick’s right front passenger seat and I directed Kick to drive her out to the ambulances. …I remember standing at the triage point at the front of the school and being frustrated. Det. Dragon or I had carried a little boy out of the building and I was attending to him near the curb outside the front doors. This victim came from Room #8. He was the only victim to be removed from Room #8. The cruiser that I had TFC Kick call for never arrived because all of the cruisers in sight belonged to personnel engaged in the search of the school. The troopers arriving were coming in on foot because the flood of parents was causing a log jam at the entrance to the driveway. 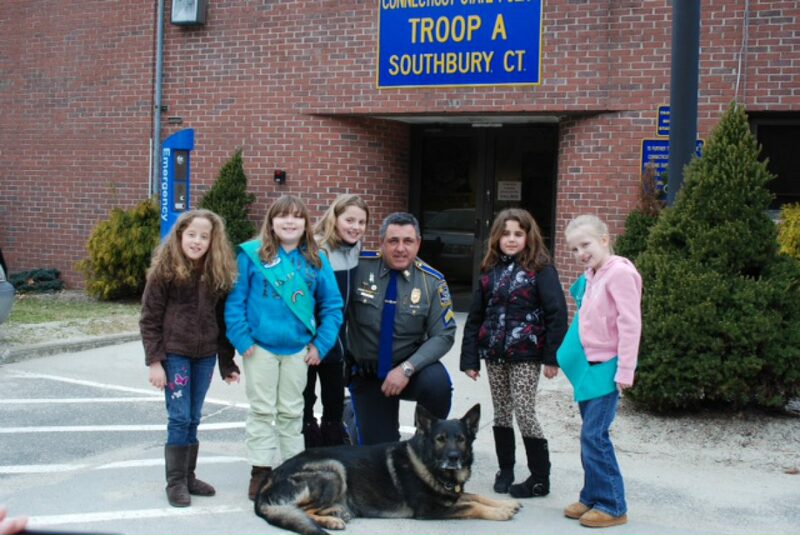 I then observed Newtown Police Lieutenant Chris Vangheli outside a black SUV near the front of the school. I told him I needed to get a victim to an ambulance and needed a ride. He agreed and looked in the passenger compartment to make arrangements. Seeing that the cargo area was empty, I told him to open the rear hatch. I picked up the boy and climbed into the back of the SUV, telling Lt. Vangheli to leave the hatch open. Lt. Vangheli sped to the end of the driveway, having to drive up over curbs and swerve around the rush of parents. I kept speaking to the injured boy although he was completely unresponsive. I knew his condition was grave, but he was still breathing and had a pulse. Looking down the driveway, I observed only two ambulances on scene. While I have no specific recollection of Newtown Officer Chapman carrying out a young female victim, I remember knowing that we had three victims in serious or critical condition and only two ambulances… I observed a paramedic arriving in a fly car… [and] explained that I was an EMT and we might have as many as 20 injured and that it was not safe for him to enter the school yet. I told him that the ER needed to be made aware… He directed me to put the boy into a nearby ambulance… When the door opened, I was relieved to see that the female [adult] patient was already in the ambulance and was alert. There was a male and female attendant in the back of the ambulance. The male said “we already have a patient”. I climbed in, told him that the female would make it to Danbury Hospital with bleeding control, and that I had a child [redacted] and that the paramedic was aware. I put the boy down on the right side bench seat of the ambulance and left. My next recollection was that when I returned to the school I went back to Room #8… had to check for possible survivors… I asked if anyone had access to a phone with a camera, as I was about to disturb the crime scene… My images of checking the children in the bathroom are not clear. I recall that the sight of the pile of children was unimaginable, and that some of the children had horrific injuries [redacted]. I know that I began to systematically check for signs of life and remove the children. I remember calling into the pile in the hope that a survivor would answer, and that I was watching and hoping to see movement. I pulled the children out of the pile one by one. As I did, I placed their bodies on the floor in the aisle of the classroom. I started nearest the bathroom and placed the children in a row leading toward the entry door. I had no specific memory of how many children I removed. [redacted] remember being disappointed as I worked my way down to the bathroom floor without finding any survivors. I stopped when I had three children left on the bathroom floor. I could access them and confirmed that they were dead. I had no room outside the bathroom for any more bodies, and I could not justify disturbing the crime scene further to remove the remaining three children. I tried to count the number of dead between rooms #10 and #8, but my mind would not count beyond the lower teens and I kept getting confused. The northern corridor of the school was still being cleared as I finished removing children from the bathroom in Room #8. I believe I re-checked the victims in Room #10, and I next went to Room #12. I remember saying that we needed to search the rooms again to check every area where a child could hide. I then heard a noise from the southwest corner of the room and recognized that a wheeled bookcase was likely concealing a bathroom. I froze when I heard the noise and Lt. Vangheli looked at me. I moved toward the bookcase announcing “State Police”. I pulled the bookcase aside and exposed the bathroom door. I could hear children talking and continued calling to them. An adult female voice asked for a badge. I couldn’t get to my badge, but Lt. Vangheli pulled his off and it was passed under the door. One of the children said “It is the police” after the badge went under the door. The female voice then said something about us needing a key to get into the room. I tried to talk her into opening the door as one of the members of the CSP ESU ran out to find a key. I believe the ESU trooper was TFC Faughnan. After telling us to get a key, the bathroom became very quiet and I became suspicious that something was wrong. TFC Faughnan arrived with a key which he handed to me. I was so anxious that I bent the key in the lock. I was able to push the door in only a few inches before there was resistance. I realized that the children were packed so tightly into the bathroom that I could not open the door. Most of the children in the bathroom appeared to be frightened and were crying. I had to squeeze the children out of the bathroom one by one and passed them off to waiting police officers and troopers. The last one out of the bathroom was the teacher, Kaitlin Roig. She was very emotional and I had to persuade her to come out. The troopers then worked together to get the children out of the building as a group. I realized that, at some point, those victims presumed dead would have to be officially pronounced dead. We also needed to impact the fewest number of EMS personnel and that we needed to preserve the integrity of the scene. Looking around, I recognized two other senior paramedics that I believed had the experience and training to handle this situation tactically. I told Cassavechia I would bring himself, Paramedic Bernie Meehan, and Paramedic John Reed into the front of the school, which was secured at that point. They were told to bring minimal equipment. As we walked to the school, I tried to prepare them for what they were about to see. I told them of the number of victims and the nature of the wounds. I told Cassavechia, “This will be the worst day of your llife.” We entered at the northeast corner of the building and I announced their presence. I walked them west down the corridor and brought them to Room #8. They were told the locations of the victims and several troopers were assigned to remain with them for cover as well as to protect the integrity of the scene. I then became part of a team following ESU [Emergency Service Unit] personnel as they cleared the building… made a complete loop [and] returned to the lobby area… I asked that all personnel involved in the initial response into the school be relieved and kept together in a group to watch and care for one another as we had been affected by what we had seen and done… Eventually, the initial responders were brought back to Troop A to meet with STOPS [State Troopers Offering Peer Support] personnel for a debriefing. Several of the veteran law enforcement officers, as well as the highly-experienced tactical paramedics expressed their disbelief, disorientation and sheer horror in regard to the nature and extent of injuries on the tiny victims of this all-too-real tragedy. This horror prompted parents, authorities and CT legislators to keep the photographic and descriptive evidence confidential, lest it become grist for the internet mill. That many Americans insist that the Sandy Hook massacre was a hoax, and that every first responder, all school staff, the families of the victims and the surviving children, and all investigative authorities as well as most of the media are complicit in a conspiracy and cover-up, simply defies common sense, reason and the universal ethical standards of any society. There are more than enough legitimate reasons to challenge the actions, responses and behaviors of police forces and law enforcement officers in the United States. But the Sandy Hook active-shooter mass-casualty event was precisely what should give us reason to praise those first responders – whether police, fire or EMS – who rush towards an active threat while civilians are running away. The responders are also victims of a horrific event like this one, and some never recover from what they saw, heard and smelled. To claim that the response was so bungled as to require a comprehensive cover-up, or to deny that this event even occurred is to willfully pour salt into the emotional and psychological wounds of every person who was effected by the experience of 12/14/2012. As followers of this blog know, I have been tireless in exposing some of the most blatant official conspiracies and cover-ups, particularly of the Kennedy assassinations and the 9/11 events – two false-flag actions that changed the world for the worse. But those of us who choose to become “vox clamantis in deserto ” (as Ed Abbey famously described himself) – the voice crying in the wilderness – have a moral and civic obligation to separate the wheat from the chaff, to discern which events are True Conspiracies and which are simply tragedies from which we must learn life’s terrible lessons. As the final word on whether any difference in the response would have altered the outcome, Dr. Lenworth Jacobs, who was asked to review the Sandy Hook victim autopsies, called together a group of experts to analyze the response and come up with a set of recommendations to increase the likelihood of survival in future active shooter mass casualty incidents. The committee met in Hartford in April 2013 and drafted the Hartford Consensus. A 188-page document was released on 10/8/2014, offering 80 recommendations for improvement in the City of Aurora’s response to the July 20, 2012 Century 16 theater shooting (many of which have already been adopted), but it also concludes that the outcome “could not have been better in terms of lives saved and rapid arrest”. The report, prepared for the City of Aurora by the TriData Division of System Planning Corporation of Arlington VA, was finished in April, but was not released until October because of “a court-imposed gag order on information connected with the case, which has not yet come to trial”. All victims with survivable serious wounds were rapidly triaged, transported to nearby hospitals, and recovered (in part, due to the fact that one of the first responding police officers was a SWAT paramedic who was able to do the in-theater triage). The first police unit arrived in less than two minutes from the first 911 call, and multiple units arrived within three minutes. The first Fire Department unit arrived in five minutes and 30 seconds and immediately engaged in patient care near the main entrance of the theater. Multiple improvised explosive devices at Holmes’ Paris Street apartment were disarmed by an interagency bomb task force, with no harm done to the building occupants or first responders. All five area hospitals receiving victims provided outstanding emergency care without having much forewarning to prepare for the influx of 60 victims, most with gunshot wounds and many in critical condition. The Public Safety Communications Department handled 6,000 calls instead of the 1,500 on a typical day, and was instrumental in alerting nearby jurisdictions to render mutual aid. Police quickly set up a family reunification center at Gateway High School, with excellent cooperation from Aurora public school officials. Victims and their families were treated with respect and given exceptional care by the Aurora Police Victim Services Unit. The Coroner’s Office and Aurora Police helped speed confirmation of the deceased victims’ identities by having a police forensic analyst use an innovative practice – taking just two fingerprints from each deceased victim while still in the theater, and matching them against driver’s license records. The general public was kept informed through a series of press conferences and press releases. 1) Failure of police and fire officials to establish a single, unified command area within the first hour after the shooting. This resulted in officers on scene radioing independently for medical assistance without coordination. “This resulted in duplicate requests, unnecessary radio traffic and an inability to control and prioritize use of EMS resources.” Field commanders and dispatch at times called for “all available units”, either police or ambulances, rather than asking for a staged response to prevent congestion and maintain availability of secondary resources. 2) Ambulance access was not identified or maintained, and ambulances could not get through the “maze” of vehicles and curbs to get close to the theater. Police officers generally could not move police vehicles not assigned to them because the cars are not keyed alike. Of the patients taken to the hospital, 27 went in police cars and 20 went in ambulances, with 3 patients loaded in each of two ambulances. Most of the critically wounded were transported by police without waiting for commander approval, which was against protocol (but almost certainly saved lives). During and after the incident there was controversy over whether fire and EMS personnel should have entered the theater, and should have gotten closer to the victims outside the theater, but they were getting mixed and contradictory messages from police. There was also confusion about whether on-line medical control from hospital physicians was necessary to determine not to attempt resuscitation of “black tag” patients inside the theater (it is not required in a mass casualty triage event). 3) Communication problems: “In spite of a fully interoperable radio system” the police department “was unable or did not know how to communicate with the fire department”. In the initial, critical minutes of response, triage and transport, no procedures were in place to ensure face-to-face contact or direct communications between police and fire incident commanders. Some critical messages were either not successfully relayed to recipients or not understood. The communication problems were exacerbated by the large volume of radio traffic. Mutual aid agencies could not be patched in to Aurora scene police radios, and the problem was compounded by lack of a designated staging area and staging officer. 4) EMS was staged a quarter mile away and there was “no clear message” that the scene was safe for EMS and fire personnel to enter the theater. At the shooting scene, first responders were unaware a suspect had been arrested and that the scene was no longer “hot”. Though some PD units were calling for EMTs, other PD units were preventing their access. 5) While the first police unit arrived on the scene within two minutes of the first 911 call, the shooting was over by that time and no police units carried tactical medical kits. Because the incident occurred during a police shift change, 14 police units were on scene within five minutes, and 55 units were on scene within 15 minutes, cluttering the scene and exacerbating command-and-control as well as communication problems. The multitude of police vehicles parked in the roadway delayed the pursuit of the second suspect, Dzhokhar Tsarnaev, and he was able to make it approximately one-half mile down the road before abandoning the vehicle on Spruce Street, fleeing on foot and eluding capture. At 12:51 AM, wounded Transit Police Officer Donohue was loaded into a Watertown Fire ambulance for transport, but egress from the area was challenging given the numerous police vehicles parked in the vicinity and blocking street access. To allow for the two paramedics to remain in the rear of the ambulance with the patient, a Watertown PD officer drove the ambulance to Mount Auburn Hospital, the nearest medical facility, approximately two miles away from the shooting scene but without a trauma center. Officer Donohue had to be resuscitated upon arrival at the hospital, but the medical team at Mount Auburn was able to save his life. It took nearly 40 minutes after the bombings for an ad hoc Unified Command Center (UCC) to be established at the nearby Westin Hotel. However, UCC leadership soon learned that the hotel lacked the capabilities and equipment to support the activities of an emergency operations center, such as large quantities of phones, phone jacks, electrical outlets, computer equipment, and other resources necessary to support emergency operations. The medical system activated to support the Marathon…was able to quickly adapt and transition from a system designed to support runner casualties to one that was able to respond to a mass casualty incident involving large numbers of critical patients… But it still required nearly 40 minutes for all critical (red tag) patients to be identified and readied for transport. Although it was known at the scene that the IEDs did not contain contaminants, this information was not transmitted to the hospitals. This slowed down the intake process, as hospitals had to make ad hoc determinations about whether or not to decontaminate incoming patients. In contrast to the press conferences, which were well managed and provided periodic coordinated messages, there was no coordination or validation of messages delivered by numerous agencies and organizations through social media. This led to some misleading or incorrect information being widely distributed through social media outlets. 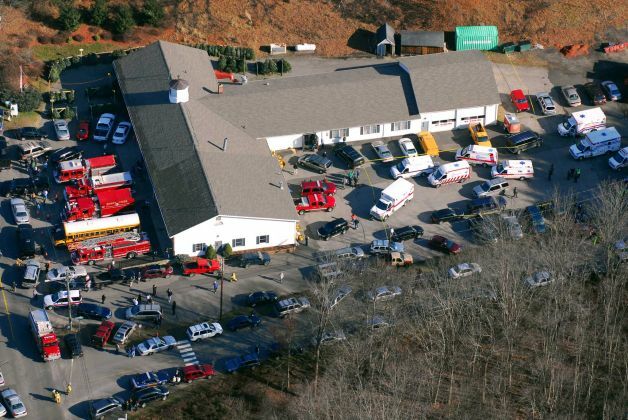 These significant problems, several of which were similar to problems with the Sandy Hook response, were in spite of annual comprehensive, multijurisdictional, multi-disciplinary planning, enhancement of the medical system with an enlarged medical tent at the finish line, and an 80-person command center that included state and local law enforcement, fire services and EMS, the MA Emergency Management Agency, the MA Department of Public Health, the MA National Guard, the American Red Cross, the FBI, and the US Department of Homeland Security – at MEMA Headquarters in Framingham to coordinate public safety, public health and EMS activities across jurisdictions, and provide situational awareness during the marathon. The report from the 16th month investigation was released to the public on 11/21/2014. While it assigns sole responsibility for the massacre to Adam Lanza, and avoids apportioning blame anywhere else, it reveals is a tragic history of a mother who devoted her life to an increasingly troubled boy, who began exhibiting signs of developmental and mental problems from age 2, but did so by protecting Adam from the world rather than helping him adapt to it. Nancy Lanza, at least since 2005, when Adam was 13 and she pulled him out of school because of acute anxiety attacks and apparently manipulated, or shopped around for, a psychiatrist who would do her bidding and keep Adam at home where he was more “comfortable”, repeatedly questioned or refused professional advice and gave in to Adam’s problematic desires and phobias. She declined a more comprehensive psychiatric examination at the hospital, declined a recommended referral to a special therapeutic school for adolescents, quickly discontinued prescribed anti-depressant medication when Adam rejected it, and acted against advice to keep Adam in a social setting to prevent a downward spiral into isolation and alienation. As the 3rd Addendum makes clear, Nancy Lanza also enabled Adam’s terminal violence by purchasing for him every gun he asked for, from his 18th birthday onward – guns that, it turned out, Adam had been researching as most appropriate for a mass murder. AL presented with significant developmental challenges from earliest childhood, including communication and sensory difficulties, socialization delays, and repetitive behaviors. He was seen by the New Hampshire “Birth to Three” intervention program when he was almost three years old and referred for special education preschool services. AL’s social-emotional challenges increased after fourth grade. There were early indications of AL’s preoccupation with violence, depicted by extremely graphic writings that appeared to have been largely unaddressed by schools and possibly by parents. AL’s anxiety began to further impact his ability to attend school and in 8th grade he was placed on “homebound” status through his education plan – a placement for children that are too disabled, even with supports and accommodations, to attend school. AL had several sessions with a community psychiatrist between age 13 and 15, though there are no medical records regarding this physician’s treatment. Through brief correspondence with the school the psychiatrist supported Mrs. Lanza’s desire to withdraw AL from the school setting in 8th grade. The district provided little surveillance of AL’s homebound status, which lasted an entire school year. Recommendations from the Yale Child Study Center, where AL was evaluated at age 14 (AL’s 9th grade year), offered prescient observations that withdrawal from school and a strategy of accommodating AL, rather than addressing his underlying needs, would lead to a deteriorating life of dysfunction and isolation. Medical and education records reflect repeated reference to AL’s diagnosis of Autism Spectrum Disorder, Anxiety, and Obsessive Compulsive Disorder. Records indicate that Mr.Lanza made efforts after the Yale Child Study evaluation to seek treatment, appropriate care coordination, and education planning for AL. Yale’s recommendations for extensive special education supports, ongoing expert consultation, and rigorous therapeutic supports embedded into AL’s daily life went largely unheeded. AL’s resistance to medication recommended for treatment of his Anxiety and Obsessive Compulsive Disorders appeared to be reinforced by his mother. According to records, AL disagreed with his Asperger’s diagnosis and may not have understood the benefit of individual therapy. Once AL was diagnosed, AL’s education plan did not appropriately classify his disabilities and did not adhere to applicable guidelines regarding education for students with either Autism Spectrum Disorders or Emotional Disturbance. Though AL showed initial progress in 10th grade with the school’s plan to incrementally return him to the school environment, his progress was short-lived. By the spring of that year, AL had again withdrawn from most of his classes and had reverted to working on his own or with tutors. AL’s parents (and the school) appeared to conceptualize him as intellectually gifted, and much of AL’s high school experience catered to his curricular needs. In actuality, psychological testing performed by the school district in high school indicated AL’s cognitive abilities were average. AL completed high school through a combination of independent study, tutoring, and classes at a local college. Records indicate that the school system cared about AL’s success but also unwittingly enabled Mrs. Lanza’s preference to accommodate and appease AL through the educational plan’s lack of attention to social-emotional support, failure to provide related services, and agreement to AL’s plan of independent study and early graduation at age 17. AL and his parents did not appear to seek or participate in any mental health treatment after 2008. No sustained input from any mental health provider is documented in AL’s educational record or medical record after 2006. Though AL was profoundly impaired by anxiety and Obsessive Compulsive Disorder, his parents may not have understood the depth or implications of his disabilities, including his need for ongoing support. AL’s pediatric records from age 13 to 17 note his obsessive compulsive behaviors, markedly underweight presentation, psychiatric diagnoses, and repeated homebound or independent study, but records don’t clearly address AL’s need for mental health treatment, and often note during high school years that no medication or psychiatric treatment was being provided. AL’s adult medical records do not reflect awareness or diagnosis of ongoing mental health issues. AL progressively deteriorated in the last years of his life, eventually living in virtual social isolation. AL stopped communicating with his father in 2010 and did not respond to numerous emails Mr. Lanza sent between 2010 and 2012 seeking to spend time with him. AL became increasingly preoccupied with mass murder, encouraged by a cyber-community – a micro society of mass murder enthusiasts with whom he was in email communication. Examination of AL’s communications during this time, while suggesting depression and, at times, suicidal ideation, does not suggest the presence of psychosis (loss of contact with reality). AL, who over the years engaged in recreational shooting activities with both of his parents, retained access to numerous firearms and high capacity ammunition magazines even as his mental health deteriorated in late adolescence. In the waning months of AL’s life, when his mother noted that he would not leave the house and seemed despondent, it is not clear that any measures were taken to curtail his access to guns or whether the family considered AL’s potential for suicide. AL was anorexic at the time of death, measuring 6 feet tall and weighing only 112 pounds. Authors cannot determine what concerns were raised by his mother regarding his eating ability or habits, or his continued emaciation during this time. In the wake of Mrs. Lanza’s stated plan to move out of Sandy Hook in 2012, and perhaps stimulated by fears of leaving the “comfort zone” of his home, AL planned and executed the massacre at Sandy Hook Elementary School on December 14, 2012. In the course of AL’s entire life, minimal mental health evaluation and treatment (in relation to his apparent need) was obtained. Of the couple of providers that saw AL, only one – the Yale Child Study Center – seemed to appreciate the gravity of AL’s presentation, his need for extensive mental health and special education supports, and the critical need for medication to ease his obsessive-compulsive symptoms. This report suggests the role that weaknesses and lapses in the educational and healthcare systems’ response and untreated mental illness played in AL’s deterioration. No direct line of causation can be drawn from these to the horrific mass murder at Sandy Hook. The dynamics presented in this report reflect common concerns over siloed systems of education, physical health, and mental health care for children. Findings in the report strongly implicate the need to assist parents with understanding and addressing the needs of children with complex developmental and mental health disorders. Relevant to this report is that a multi-state review conducted by the federal government confirmed that many states struggle with a dramatic lack of effective services for transition-age youth diagnosed with autism spectrum disorders. While this report focuses on educational, physical and mental health issues, the authors recognize the significant role that assault weapons and high capacity ammunition clips play in mass murder. That AL had ready access to them cannot be ignored as a critical factor in this tragedy. Assault weapons are the single most common denominator in mass shootings in the United States and as such, their ready availability must be considered a critical public health issue. The likelihood of an individual with Autism Spectrum Disorder or severe problems with anxiety and obsessive compulsive tendencies committing an act of pre-meditated violence, much less one of AL’s magnitude, is rare. Individuals with those mental health or developmental disorders are more likely to internalize (that is, to feel distressed emotionally or to be confused, socially inappropriate or inept, and sometimes to harm themselves inadvertently or intentionally) than to externalize (that is, to act out aggressively so as to harm others). In AL’s case, his severe and deteriorating internalized mental health problems were combined with an atypical preoccupation with violence. Combined with access to deadly weapons, this proved a recipe for mass murder. Autism Spectrum Disorder or other psychiatric problems neither caused nor led to his murderous acts. While authors describe the predisposing factors and compounding stresses in AL’s life, authors do not conclude that they add up to an inevitable arc leading to mass murder. There is no way to adequately explain why AL was obsessed with mass shootings and how or why he came to act on this obsession. In the end, only he, and he alone, bears responsibility for this monstrous act. Systems must facilitate and financially support universal screening for behavioral health and developmental impairments for children ages birth to 21. This is especially necessary within a pediatric primary care setting, with a financial reimbursement strategy to incentivize compliance with screening requirements. A child today displaying the types of multidisciplinary developmental challenges AL presented should be referred for thorough evaluation and assessment, including medical, psychological, occupational, speech and language, social-emotional, and neurological testing – evaluation by outside experts should be available to inform clinical and educational decision-making. Children and their families should have access to quality care coordination, often reserved only for children with complex medical needs, but beneficial for children with developmental challenges and mental health concerns. Care coordination should facilitate more effective information-sharing among medical, community, and educational providers. Teachers, administrators, related service personnel, pediatricians, and parents need access to training and information concerning mental health issues as they arise during the developmental years and in the context of changing environmental expectations. Providers must have the staffing and financial supports to deliver family-focused support. Services for children and families must be sustained, rather than episodic and periodic. The duration of services must be tied to measurable outcomes rather than predetermined service schedules. Effective and sustained family engagement work must be part of mental health treatment for children. The role of denial of illness is a relevant theme in this report. While the roots of denial are complex, our healthcare system must address the role that stigma plays in the minimization of psychopathology. Parents may be overwhelmed with their own difficulties and the burdens of daily care and support for a youth with significant disabilities. States must increase access to therapeutic services, psycho-education, and peer support for families who have children with specialized needs. Systems must be ready to respond supportively and appropriately (up to and including a referral to child protective services) when a parent, even with education and resources, appears unwilling or unable to meet the needs of their child. A recurring theme in this report is the struggle of a parent whose child has a severe disability to figure out how to alleviate his pain and protect him from stress and harm. When the parent has difficulties reaching out to helping providers or feels mistrust in the medical and educational systems, her efforts can become unwittingly destructive of the child’s development and well-being. Our health care and educational systems must become better at reaching these parents and helping the children. The goal of interconnection among separate systems within the mental health arena can only be successfully achieved through the integration of schools and their active participation concerning the mental health and wellness of their students. Schools should have support and greater flexibility to retain or import therapeutic and other related services (such as occupational therapy and behaviorist services) into the school setting, and funding and reimbursement mechanisms must be strengthened. Schools must ensure that they are evaluating children in all areas of suspected disability, including conducting social-emotional evaluations. This is particularly critical for a student with known or suspected ASD, even when academic concerns are neither raised nor immediately evident. By asking special education teams to specify a child’s eligibility under a specific (or single) label – meaning what is the “right” disability – there is a tendency for interventions to focus on only one aspect of a child’s learning and development. This focus on “primary disability” may mitigate against a truly comprehensive support system for the child. It is essential that a more holistic approach to identification for special education eligibility that encourages attention to multiple aspects of disability – as was true in AL’s case – be undertaken. The state/s should consider an audit of existing homebound practices and procedures, and a needs assessment of the population of students who are currently or who have been placed on homebound within a certain timeframe. Much more attention needs to be paid to post-secondary readiness for disabled youth and young adults, with a focus not only on academic skills but the ability to live as independently as possible, with or without community supports. A major issue faced by families is the paucity of services and supports for children and youth, particularly older youth and adults, who have Autism Spectrum Disorders with or without co-occurring mental health challenges. State and local educational and mental health and developmental services agencies must work together to identify current capacity and service delivery needs, training opportunities, and must create capacity-building services at all levels. Dramatic workforce development needs, increased technical support, and expertise will be required to help mental health, pediatric, and educational providers meaningfully meet the needs of children with complex developmental or mental health disorders, and their families. Schools may not be equipped to provide, or even to import, comprehensive behavioral health or developmental supports to children, and will need significant support to ensure adequate expertise and related services for children with highly specialized needs. This chronology seems clearly to implicate Nancy Lanza in providing her very troubled child with firearms for his birthdays and Christmas, likely in response to his requests for the weapons he had carefully researched on-line in gun and mass-shooter forums, and which he used in cyberspace. 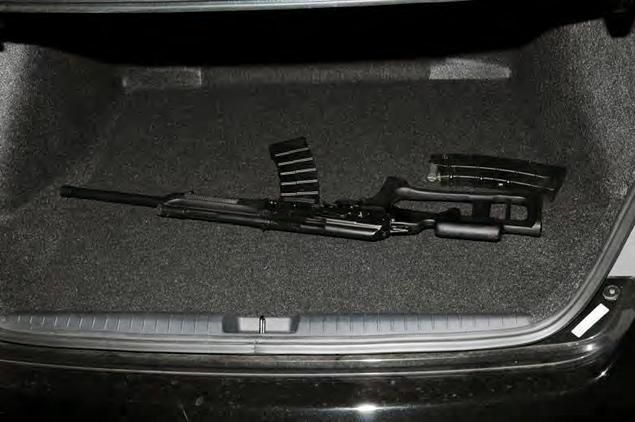 March 16, 2010: Nancy Lanza orders an MD Arms 20-round drum magazine for an Ishmash Saiga-12 12-gauge shotgun, via the site Gunbroker.com (see the official Sandy Hook report, Book 7, document 00159951). March 29, 2010: Nancy Lanza completes the purchase of a Bushmaster XM-15 .223 from Krystopher DiBella at Riverview Gun Sales in East Windsor. 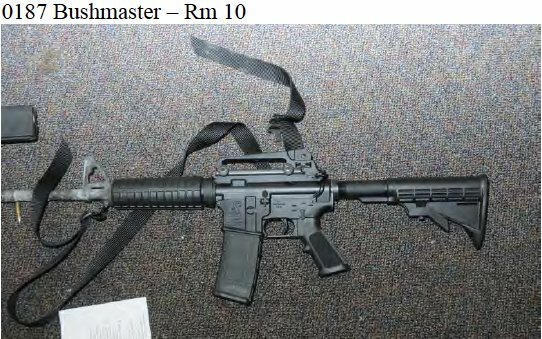 This is the rifle used in the Sandy Hook shooting more than 2 years later (see official report document 00151485, book 4). April 10, 2010: Nancy Lanza completes the purchase of an Izmash 12-guage semi-automatic shotgun. 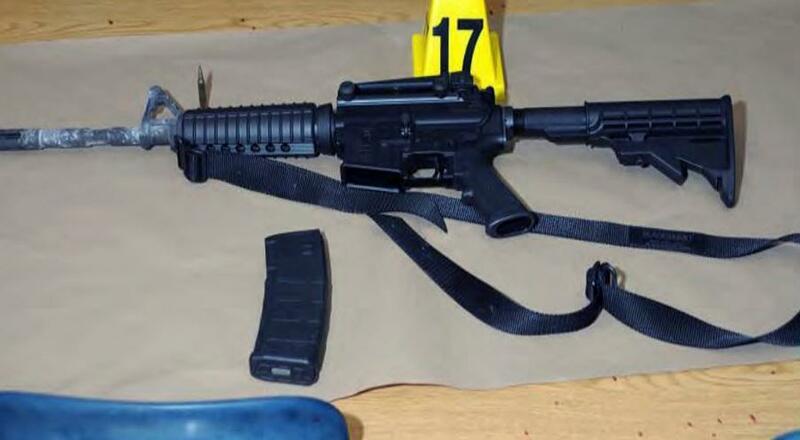 Adam Lanza brings this weapon to Sandy Hook 2 years later, but leaves it on the passenger seat of his car. Duct-taped double 10-round magazines are left in his desk drawer, and the 20-round drum is left in his closet (see official report document 00151485, book 4). April 22, 2010: Adam’s 18th birthday – were these guns his birthday present from his mother? Brother Ryan Lanza told police that the AR15 belonged to Adam (it was registered, however, in the name of Nancy Lanza, as were all the guns in their home). February 18, 2011: Nancy and Adam Lanza shoot guns at Shooters Indoor Pistol Range in New Milford, CT (see the official Sandy Hook report, Book 7, document 00222826). 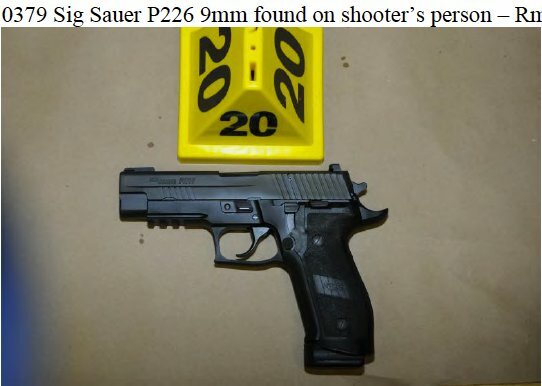 March 16, 2011: Nancy Lanza purchases a Sig Sauer P226 9mm pistol. 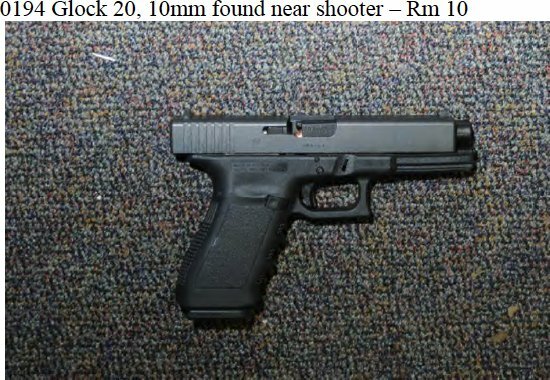 Adam Lanza armed himself with this gun at Sandy Hook less than two years later, but never fired it (see official report document 00151485, book 4). March 24, 2011: Nancy Lanza sells a Ruger Mini-14 Ranch Rifle to an unnamed party, apparently a gun store or pawn shop (see the official Sandy Hook report, book 7, document 00160023). 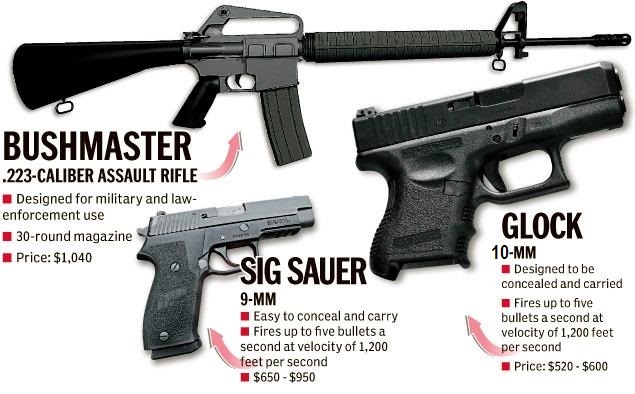 April 22, 2011: Adam’s 19th birthday – was the Sig Sauer also a birthday present from Nancy to Adam? December 21, 2011: Paperwork is printed, later found in the Lanza home, entitled “Connecticut Gun Exchange, Glock 20SF 10mm FS 15 round FC”. Presumably, this is the order confirmation for the Glock she finishes purchasing weeks later. December 25, 2011: Christmas – was the Glock a Christmas present from Nancy to Adam? January 5, 2012: Nancy Lanza completes the purchase of a Glock 20SF pistol. This is the weapon Adam Lanza would commit suicide with less than a year later (see official report document 00151485, book 4). Christmas, 2012: Some time before she was killed and Adam went on his rampage, Nancy writes Adam a check, with the memo section reading “CZ 83 firearm”, and the date as “Christmas”. 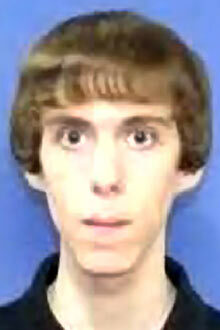 As “Kaynbred”, Adam Lanza registered at three gun-enthusiast websites – Glocktalk.com, NortheastShooters.com, TheHighRoad.org – and on Wikipedia (where he registered to edit pages on mass murders, with particular focus on their weapons), as well as at the online game Combat Arms (in which he chose a Glock 23 and tried to unlock the virtual Saiga shotgun). Just before his 18th birthday, right around the time of the AR-15 purchase, in late February/early March 2010, Kaynbred vanishes from the internet (perhaps because he has completed his research, chosen his arsenal, and submitted his requests to Nancy). The Bushmaster arrived in the Lanza home right in time for Adam’s 18th birthday, as he reached legal adulthood. At that point, Adam created a new online persona as “Smiggles” and submitted the sum of his research, in the form of the much-noted spreadsheet, to the Super Columbine Massacre RPG forum in March of 2010. Apparently, Adam Lanza no longer considered himself the student of guns and mass murders (as “Kaynbred”), but the master of mass murder (as “Smiggles”) intent on fulfilling his sublimated mission of becoming a military commando. Thank you for making this blog. I will never understand people that call this event a hoax. I’ve read the official report, seen the available photographic and ballistic evidence, and read blogs such as yours and that by CW Wade, and when put together these materials tell a story that is straightforward and terrible. I just want to say all the first responders and teachers are all heroes. Everybody did the best they could to save these people. I blame Adam’s parents and Adam for all of this as there was no reason to have these types of guns in a house with a mentally ill person. The terror and pain the officers and EMT’s went thru is unimanigiable. We live in a gun crazed society and it’s unfortunate that innocent people had to pay the price. 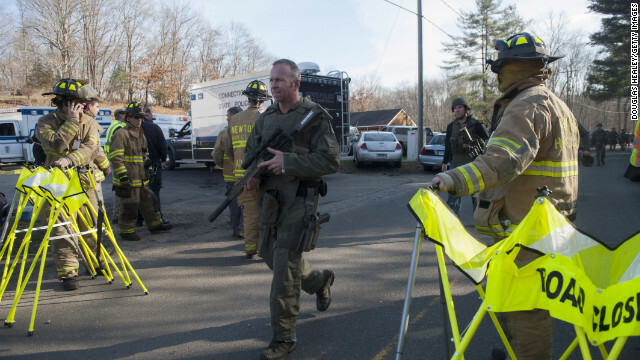 May God bless the Newtown police, Connecticutt State Police and all firefmen and EMT’s that responded to that scene. Still waiting for one crime scene photo that proves someone was shot. I approved James Ginn’s comment only as an example of the kind of willful ignorance and malicious idiocy that is rampant among a small but very vocal segment of the American people. My article, of course, includes an official crime scene photo showing the long blood trail outside the front door, precisely where Sgt. Cario describes carrying the dying boy from Room #8 and attending to him at the curb pending transport. 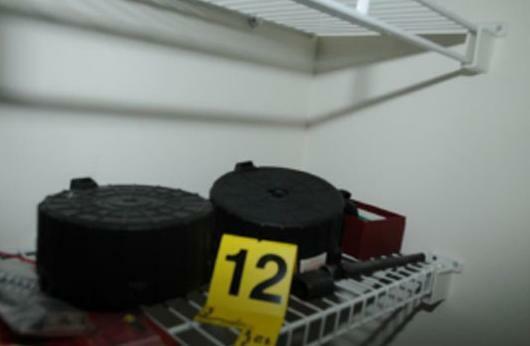 And there are many officially-released crime scene photographs of the blood stains left behind by the carnage, as well as precise descriptions and locations of the 154 AR-15 shell casings found at the scene. There is the official medical examiner’s determination of cause of death of all victims: multiple gunshot wounds. But no amount of evidence will convince those who prefer irrational conspiracy theories to self-evident truth. P.S. James Ginn had the audacity to respond (in a followup comment which I will NOT approve) that his skepticism is based on “common sense”. He thereby proves only that common sense is the least common attribute (along with rationality and common decency) of those who willfully blind themselves to such great tragedies as this. How do you explain the kill ratio? I approved waste’s question only as an example of the mindlessness that fuels the fringe “Sandy Hook Hoax” movement. No rational person could even ask such a question, since shooting first graders with a semi-automatic assault-style rifle in the confines of a couple of classrooms is almost perfectly analogous to “shooting fish in a barrel”. I spent part of this evening reading your blog… today’s date is December 14, 2015 (3 years to the day after the horrific events at Sandy Hook Elementary School). I want to thank you for providing this information to interested people. It makes for heartbreaking, though informative, reading. I share your opinion — I cannot see how any thinking person can deny that this awful tragedy happened. God bless the first responders and all those whose lives were either cut short or touched by the events of that terrible day. I just like the helpful information you supply on your articles. I’ll bookmark your weblog and test again here regularly. I’m reasonably certain I’ll be informed many new stuff right right here! Best of luck for the following! Thank you for this. I have never delved into the specifics of this horror before but have come across numerous references to it being a false flag, none of which really had any substance. Don’t know how anyone could think this event, the timeframe, mortality rate, any of it were not all too believable. I have no doubt our government has conceived and executed many false flag events, this is not one. There were cctv cameras in Sandy Hook. Where is the footage? Where were the 600 people who were evacuated? Where was the medevac helicopters? 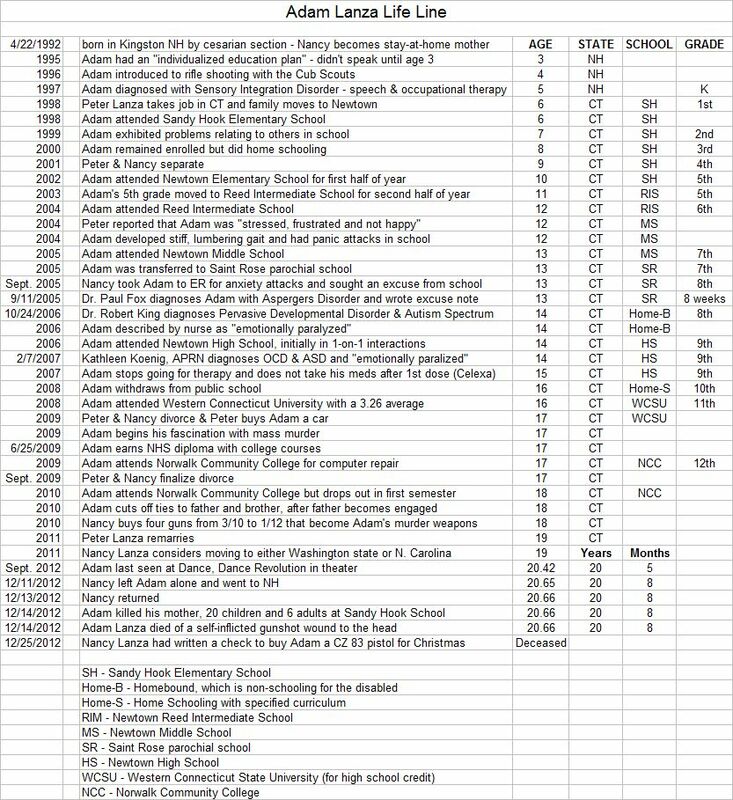 Final police report no Adam Lanza DNA on the weapons used to kill all these people. Maybe Adam was just another victim? If everything was so simple why classify all the reports. If Adam Lanza did it, everyone died and that was it why not just release all of the information. Its like JFK all over again. If Oswald shot JFK then just release the proof instead of keeping it hidden for 50 years. The government can classify info to get away with any crime they want. Just classify the info, then once,everyone is dead then umclassify it. Though I will not approve the typical conspiracy BS that is still circulating among the ill-informed and low-intelligence minions of cyberspace, this particular brand if willful ignorance deserved exposure and response. It’s author, Craig Spencer, will enter my Hall of Shame. There was ample mainstream media reportage to answer all of Craig’s inane questions, and the mere fact that he asked them proves that he is more interested in propagating lies than in understanding the truth. Yes, there was a closed-circuit TV camera at the entrance, which had a direct line to a monitor in the office so visitors could be vetted and buzzed in through the new bullet-proof security doors. But, as has been well reported, there was no video recorder, so there is no “footage” to reveal. 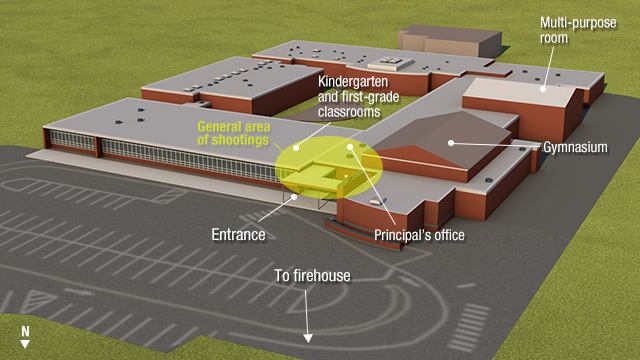 The Sandy Hook Elementary School community included about 557 teachers, staff and students, and it was also well documented that they were evacuated in groups (there were well-publicized pictures of state police leading students across the parking lot) from the NE corner of the school building to the firehouse, starting just eight minutes after the first police arrived on scene. Medical helicopters are not used in situations in which ground ambulances can transport patients just as efficiently, and there were more than enough ambulances on scene to take care of the small number of surviving injured. 6. The results eliminate N. Lanza (item #13-S2) and A. Lanza (submission #14) as the source of the DNA profiles from item #4-1S5 (swabbing – handle area of rifle), submissions #40 (swabbing from “drivers exterior door handle”), and #41 (swabbing from “drivers exterior rear door handle”). Adam was wearing gloves and it’s highly likely that there was so much spattered blood on his gun that any DNA evidence would be highly corrupted. Adam Lanza was definitively proved to have been shot by his own gun in an upward direction through his head, and that it was the last shot heard by first responders one minute after arriving. There was nothing “classified”, and the entire investigative report and supplemental information was released to the public, with the usual legally-mandated redactions for personally-identifiable information. And Connecticut passed a very reasonable law preventing the public release of crime scene photos when juveniles are murdered. There is absolutely no comparison between the Sandy Hook shooting and the JFK assassination, which was proven to be a government conspiracy and cover-up (as I have thoroughly documented here in twelve long articles). So Craig displays the wanton ignorance and willful idiocy that is emblematic of Sandy Hook Hoaxers, and I will expose anyone else who tries to post such hateful nonsense on this site. I notice that you only post comments from people that you either agree with or you can shut down without a real answer. Asking questions is not harassment , and I agree there are those out there that are over the top with their comments and threats. And do not deserve a platform which to comment for shock value only. However , If you offer a place to leave a reply you should reply . What you are doing is nothing short of censorship. What you “notice” is what you choose to see through a very thickly distorted lens of ignorance and bias. What I will not tolerate, and certainly not propagate by publishing here, are those who disagree with the well-documented facts, and with reason. All legitimate questions have been answered. Censorship is the willful blocking of competing but valid ideas from a public space. What I will not publish on my personal blog site are fraudulent claims, deliberate distortions of fact, and wanton manipulations of the truth for anti-social agendas. This site is the home for my ideas, my investigations, my thousands of hours of dedicated work, which I share as my gift to the world. This site is my home and you, the readers, are my guests. I have every right to choose whom I allow in my home. Those who choose to contribute constructively to the world are welcome here. Those who choose otherwise are not. By your comment (which I have chosen to publish) it appears that you are on the side of malicious falsehood rather than the self-evident truth, so you are not welcome on this site; and if you reply with anything more, you will be added to my Hall of Shame. You came to the Sandy Hook threads EARLY in this game. Your sole mission: to convince us that the emergency services response to Sandy Hook was 100% A-okay. You claim to be a first responder, Robert – where are you? How do you explain the fact that for three years and counting you have violated your oath by covering up the ineptitude of your fellow first responders in Newtown? The one who hides like a coward behind the handle “Zephyr” is the latest to join my Hall of Shame (see top of page and let him know what you think of him). By his choice of words, it’s clear that “Zephyr” considers one of the greatest human tragedies in the US to be a “game”, and he wantonly misrepresents my analysis, as I have never claimed that the response was 100% correct – only that nothing in that response made any difference in the outcome. Among “Zephyr’s” many lies is that Dr. Jacobs participated in the Sandy Hook autopsies – he did not, but was merely allowed to review the autopsy reports after the fact for his “Hartford Consensus” project, which aimed to improve medical response to future mass casualty events. In fact, the report which Jacobs helped author stated explicitly that “injuries in 26 victims…were immediately lethal” (20 children, 4 teachers, Adam Lanza and his mother). Dr. William (not Wayne) Billups did not participate in the review, and is a surgeon in Missouri who was either misquoted in a local news outlet (the Meridian Star) or misread the Hartford report, which stated the exact opposite. Zephyr has been hounding me for years with this kind of willful misrepresentation, and malicious slander of the Sandy Hook first responders and law enforcement. He is among the very worst of the conspiracy mongers. Thank you for this post. I only wish all the “truthers” could read it and get on with their lives. People can’t comprehend the fact that anyone could kill 20 small children in cold blood, so they come up with these theories as a defense mechanism. It’s understandable, but in my eyes, very offensive to those who suffered the loss of these victims. 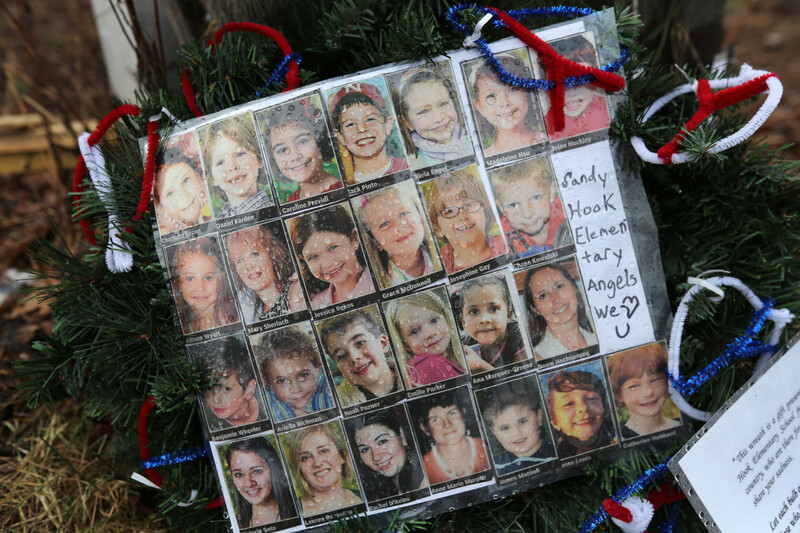 Sandy Hook was a tragedy beyond words. But you should really check your facts before posting pictures with “stats” about handguns rounds per mintue that are inaccurate. Devalues your position. Stick to facts. As for the people who think this was a hoax. They are simply delusional. Sorry Peter if you like only facts that agree with your personal bias, but I post all the facts, sourced from the most reliable experts. 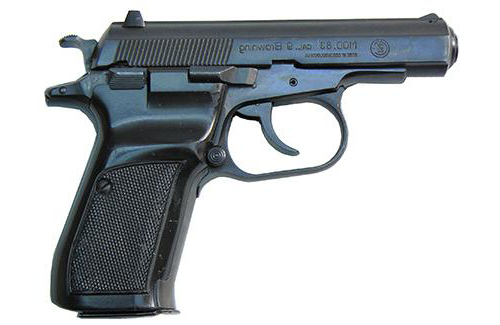 The firing rate of a handgun is not the same as the firing capability of an average user. And this fact is immaterial to the subject of this article. The fact is that people intent on mass public shootings prefer assault weapons and large-capacity magazines specifically because they allow for maximum carnage. Thank you for your reasoned comments. Why do “truthers” always think that video manipulation is always done by the authorities, as opposed to some wingnut who has manipulated it to create a conspiracy theory? I have always been enamored by conspiracies and government corruption, so naturally when my boss referred me to a slew of videos and articles about the “Sandy Hook Hoax” I dove right in. I am ashamed to say that I was almost sucked into the dark side, some are actually quite convincing (if you only watch them and don’t check all the facts from all sides). I then looked at the other side including your blog and I came to the realization that it was clearly not a hoax. It was a tragedy perpetrated by a young man who was clearly mentally ill. I found it difficult to understand why people tried so hard to “prove” it did not happen, I wondered if they simply didn’t want to comprehend children being slautered. But sadly it seemed to me that the ultimate purpose of many was to attack Obama and his administration and those wanting to put bans on guns and their owners. I understand the government is corrupt but now every single tragedy is said to be a false flag or hoax and it gets very confusing. I believe you approach each and every incident with a clear head and sound logic and I will continue to read your blogs and articles. Thanks. Very good work! I never understand why this so called “truthers” dont get it. I mean there are no question left(beside his motives) Im from germany and even here our newspapers wrote about this retarded hoaxers. Its prooven that Adam acted alone. The most disturbing theorys are why they no eyewitnesses and only one injured. The Answer is clear cause no one (besides Room 8 survivor) can tell what happened cause they all dead. It seems unbelievable but this really happens. Unbelievable in the sens of why someone do this. Greetings from Germany and thank you for sharing the truth! The name “conspiracy theorists” is designed to make people with open minds and people who aren’t brainwashed by the media sound awful and crazy. Actually we’re pretty decent people who just look a bit deeper and don’t just straight away accept the official story. We spot patterns. The biggest pattern is the fact that in the London 7/7 bombings, 9/11 and Sandy Hook, training exercises were being run to deal with almost an identical scenario. Now, that to me is very strange. Sandy Hook also took place at a time when there was a big push against gun control laws. The smoking gun for this is the photo of the military men towards the top – the man in the centre has a rather striking resemblance to the supposed father of victim Ben Wheeler, David Wheeler. Why would he be there as part of the military personnel. As far as i know, he was never in the military? Many Facebook and fund me pages that were set up after the attack were actually found to have been set up BEFORE the attack, and when people noticed this, they conviniently disappeared. Lastly, people think that conspiracy theorists somehow enjoy finding these things – trust me, we don’t. It rips me to shreds to know and think these things. It makes me question everything around me – do we really live in the society that we think we do, how much power do the people really have? It really hurts. But ignorance is not bliss. These deceptions cannot continue. Peace. I’m posting your comment as a perfect example of what happens when an “open mind” becomes a loose canon and uncritically swallows gallons of disinformation that has been thoroughly debunked by responsible sources. I’m also including your name and email address above as 2017’s first entry in my Hall of Shame. Only those who have already concluded that Sandy Hook was a faked event “spot patterns” that no rational person would accept as legitimate – and, even worse, patterns based on patently false “facts”. There was a CT All-Disaster training exercise scheduled for 12/14/2012 in Bridgeport – not Sandy Hook – and it was one of seven scheduled throughout the state for November and December of that year. The much-touted “Everyone Must Check In” sign at the firehouse was placed the day AFTER the shooting, as is clearly evident from all the photos of the event. Facebook pages – as any truly open-minded person would have known – are time-stamped on the date they are originally posted, regardless of how many times they are modified or repurposed. All other such date irregularities have been thoroughly explained by rational and sane people. I doubt that it really “hurts” you to believe and propagate these malicious falsehoods. Those who do so get some kind of sick thrill from it, or they wouldn’t be continuing to do so more than four years after the tragedy. I study criminology at university and take an interest in mass shootings, and specifically the prevalence of school shootings in America. 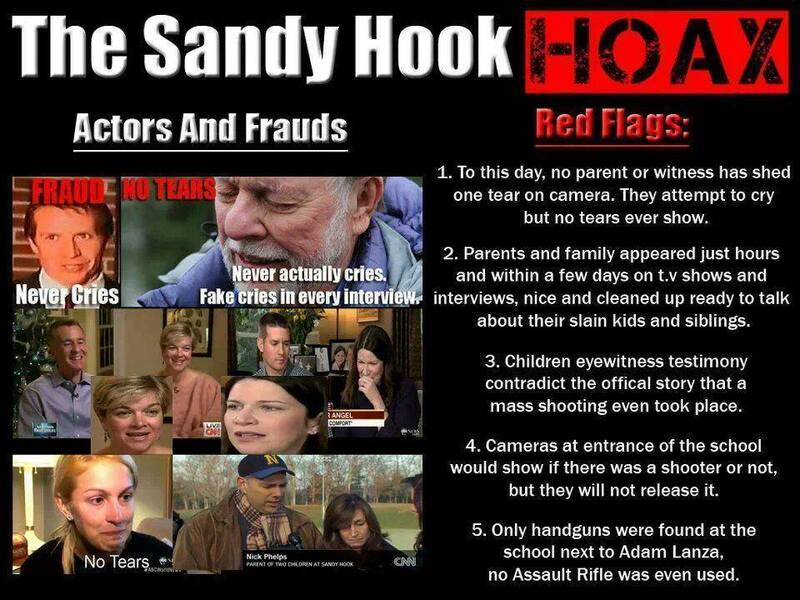 I have only recently come across the “Sandy Hoax” theory… What strikes me the most about Sandy Hook is that it deviates from all other mass shootings in that the perpetrator never documented or made clear any motive for the incident. Arabella, you and your email address are now entered into my 2017 Hall of Shame. I don’t publish deliberate and devious attempts to propagate Hoax theories based on willful distortion of the facts – all of which are available to those who truly care to know. Adam Lanza DID make his motive perfectly clear, and it is discussed in this article, which you obviously haven’t bothered to read. Sandy Hoax was a joke and frankly my intelligence is insulted that they tried to pull this poorly coordinated “mass casualty” event as a real time tragedy…[for] at least two agendas…gun control laws and the screening of children for what they claim are “mental health issues”. “Dale Smith” has just been added to my 2017 Hall of Shame. It’s beyond belief that those who despise truth and justice are still able – going on five years later – to recruit useful idiots like Dale Smith to their cause. Thank you for your painstaking detail. May the souls of the departed children and adults who so bravely lost their lives to protect them, be in peace in the love of God and may their families know they are safe now. I want to say one fact I have learned from my own experience of suffering trauma. People accuse parents or those affected of not shedding tears and use this as evidence of a fake event. I was bereaved twice by suicide. My husband killed himself. When the policeman told me, I went numb from just below my waist down. I was fully conscious. My mind raced to think how to tell my three daughters. BUT I shed no tears. I even remarked that I was not crying and the Policeman said that was normal because of shock. Then, 16 years later I found the dead body of a friend who had stabbed himself with 2 long knives in the neck and stomach. It was worse than a horror film. He had rigor mortis and looked as if he were trying to grab me. I dialled 999 and tried to speak but was screaming and upset. BUT I did not cry tears! Again I remarked on this to the Police and ambulance crew, saying the films are not realistic. They said I was in extreme shock and I was their patient now. So, you see, the parents probably had no tears. Some things are too terrible for tears. My question is: Were you there at Sandy Hook when this happened? Nor was I. Our views are based on who we believe is providing the truth and who we believe is trying to deceive us. Governments through out the history of our planet have ALL been corrupt and deceitful to the people they govern. And right now the United States Government is very close to the top of the list of the most deceitful government in history. So my view on most important issues is due to personal research and questioning anything that my government or mainstream media tells me. I know that my research can lead me the wrong direction and that my government might actually tell me the truth. But when someone’s opinion is backed by mostly government sources . . . . my thoughts are either that person is part of the government or doesn’t get out much. We all (for now) have the freedom of making our own choices, but not to choose the consequences of our choices. Each to his own. “Rhyno”, you don’t have a question – you have a grossly ignorant and abjectly biased point of view that you insist on imposing on the rest of the world, even if it makes that world a coarser, less sympathetic and meaner place. There is no question, in the case of the Sandy Hook school massacre, what the truth is and who the liars are. The liars (and you seem to include yourself in that category) are those who question the veracity of the shooting, the unimaginable grief of the parents and families and survivors, or the integrity of the first responders and the media who were involved in this terrible tragedy. To claim that “governments through out the history of our planet have ALL been corrupt and deceitful to the people they govern” is to admit to a juvenile ignorance of human history and the spectrum of governance systems and institutions. To claim that “the United States Government is very close to the top of the list of the most deceitful government in history” is to make a statement about the man occupying the Oval Office (who has offered an average of six demonstrable lies per day of his administration), but not about the dedicated civil servants who comprise the overwhelming majority of government, nor necessarily about the members of Congress who, like most people, cover the range from honest to manipulative and self-serving. To pretend that the information about the Sandy Hook shooting comes only, or even mostly, from government sources is to admit to a willful blindness. The myriad sources of reliable information include the parents and teachers of Sandy Hook, the EMTS, fire fighters and both local and state police, the mainstream media of every variety, and the scientific researchers who have studied this and other similar phenomena. The above treatise on Sandy Hook draws from every available source, using more than a half century of well-earned discernment to differentiate between more or less reliable sources. When multiple sources corroborate each other, then a judgement of confidence is warranted. Yes, we each have the freedom to choose. I have chosen to be a spokesperson for proven facts, demonstrable truth, rational conclusions and utter contempt for those who prefer wanton lies and hate-mongering to mature, intelligent argument. You have firmly planted yourself on the other side of the Rubicon of truth and justice, and you deserve whatever consequences come to you for that choice, even as you hide like a coward in the shadows of anonymity.